This festival is held every year at the time of Easter. It is a tradition of many centuries ago.The schiacciata is made by the local people and you must come here to taste it. It has a special savour and is delicious. The recipe of the schiacciata is not very difficult ,but it takes a long time to prepare and needs a lot of patience. There are various stalls which sell various articles like antiques , hand made articles and other local souvenirs. There is a spirit of gaiety and laughter and there are some comedians for children. Sometimes the local people put up a small play which is about mundane life, people and local customs. The entrance for this festival is free for all adults and children. This year the festival was on the 13th of April and it started at 10.30 in the morning with a brief inauguration by the Pro loco of Montecastello. Lunch and dinner could be savoured in the local premises at a small cost. The schiacciata could be tasted and bought too as well as local artisan food products. There was an exhibition of photos of Montecastello-past and present. There was a floral exhibition and sale of plants and a view of old cars of the 50’s and 60’s too. There was a lucky dip for beneficience. 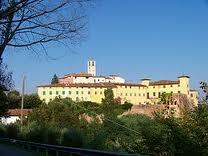 There was also a trekking trip planned,to explore the rugged paths of Montecastello- San Gervasio. From 3-5 p.m. there was the Veglia of Montecastello, near the church, where the old people of Montecastello relate anecdotes and stories of their youth, making people laugh and cry. This year there was a small musical band and folk music with a well known singers Lisetta and Marta to the music of a guitar and mandolin. At 21.15 one could observe the stars and astronomers could feast their eyes with binoculars on a glittering sky full of stars and planets from the cemetery park with no lights. Free Transport- navetta bus from the cineplex of Pontedera to Montecastello was organised and also there was ample parking space near the cemetry for cars. 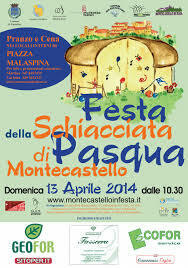 I would highly recommend this festival and suggest you to visit Montecastello for this schiacciata festival next year.